Today's topic is about snapshots, snapshot formats, and effective snapshot use cases. Today's post name is – VCP6.7-DCV Objective 5.1 – Determine effective snapshot use cases. We still follow VMware blueprint which gives us topics for our VCP-DCV 2019 Study Guide. The work in progress page gets updated almost daily. Check back soon. Maybe you don't know, but you can earn the title VCP-DCV 2019 certified even without passing the Professional vSphere 6.7 Exam 2019 as you can still pass the VCP6.5-DCV exam. Also, there are fewer chapters in that guide. Did you know? Snapshots let you capture the state of the virtual machine, including the virtual machine memory, settings, and virtual disks. You can roll back to the previous virtual machine state when needed. However, snapshots aren't backups. You should use a backup software leveraging snapshots to create first full and then incremental backups allowing you to restore. When you take a snapshot, the state of the virtual disk is preserved, which prevents the guest operating system from writing to it. A delta or child disk is created. The delta represents the difference between the current state of the VM disk and the state that existed when you took the previous snapshot. On the VMFS datastore, the delta disk is a sparse dis k.
Sparse disks use the copy-on-write mechanism, in which the virtual disk contains no data until the data is copied there by a write operation. This optimization saves storage space. If you migrate a VM with the VMFSsparse snapshot to VMFS6, the snapshot format changes to SEsparse. When a VM with a vmdk of the size smaller than 2 TB is migrated to VMFS5, the snapshot format changes to VMFSsparse. VMFSsparse – is a newer format which is implemented on the top of VMFS. VMFSsparse is implemented on top of VMFS. The VMFSsparse layer processes I/Os issued to a snapshot VM. Technically, VMFSsparse is a redo-log that starts empty, immediately after a VM snapshot is taken. The redo-log expands to the size of its base vmdk, when the entire vmdk is rewritten with new data after the VM snapshotting. This redo-log is a file in the VMFS datastore. Upon snapshot creation, the base vmdk attached to the VM is changed to the newly created sparse vmdk. 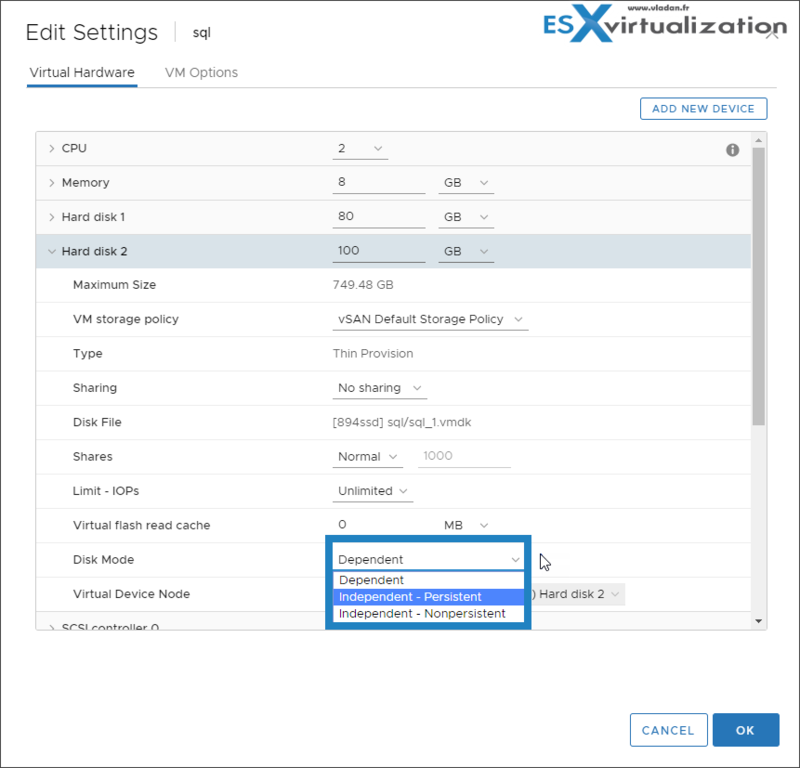 SEsparse is a default format for all delta disks on the VMFS6 datastores. On VMFS5, SEsparse is used for virtual disks of the size 2 TB and larger. SEsparse is a format similar to VMFSsparse with some enhancements. This format is space efficient and supports the space reclamation technique. With space reclamation, blocks that the guest OS deletes are marked. The system sends commands to the SEsparse layer in the hypervisor to unmap those blocks. The unmapping helps to reclaim space allocated by SEsparse once the guest operating system has deleted that data. Snapshots are not available when RDM in physical compatibility mode is used. They're available for RDM in virtual compatibility mode. So what's the use case for snapshots? One of the use cases is, for example, an upgrade of VMware virtual hardware version. (aka VM compatibility). Before an upgrade, you take a VM snapshot, then you upgrade the VM hardware version. If everything works as expected, you can delete your snapshot. If something is not working, you can revert back. Leave enough space on your datastore. For snapshots – Ensure that you leave sufficient space for virtual machine creation and other virtual machine operations, such as growth of sparse files, snapshots, and so on. You can take multiple snapshots of a virtual machine to create restoration positions in a linear process. With multiple snapshots, you can save many positions to accommodate many kinds of work processes. Snapshots operate on individual virtual machines. Taking snapshots of multiple virtual machines, for example, taking a snapshot of a VM for each member of a team, requires that you take a separate snapshot of each team member's virtual machine. Snapshots are useful as a short term solution for testing software with unknown or potentially harmful effects. For example, you can use a snapshot as a restoration point during a linear or iterative process, such as installing update packages, or during a branching process, such as installing different versions of a program. Using snapshots ensures that each installation begins from an identical baseline. With snapshots, you can preserve a baseline before making changes to a virtual machine. Parent Snapshot – a first snapshot in the hierarchy. The most recent saved version of the current state of the VM. Child Snapshot – A snapshot of the VM taken after the parent snapshot. Each child snapshot contains delta files of each attached VMDK. Each child snapshot's delta files merge with each previous child snapshot until reaching the parent disks. A child disk can later be a parent disk for future child disks. A Take Snapshot operation creates .vmdk, -delta.vmdk, .vmsd, and .vmsn files. By default, the first and all delta disks are stored with the base .vmdk file. The .vmsd and .vmsn files are stored in the virtual machine directory. Delta disk files – a VMDK file to which the OS can write. Delta disk is the difference between the current state of the virtual disk and the state that existed at the time that the previous snapshot was taken. Flat File – A -flat.vmdk file that is one of two files that comprises the base disk. The flat disk contains the raw data for the base disk. (Not visible in the datastore browser). Database file – A .vmsd file that contains the virtual machine's snapshot information and is the primary source of information for the Snapshot Manager. Memory File – A .vmsn file that includes the active state of the virtual machine. Capturing the memory state of the virtual machine lets you revert to a turned on virtual machine state. What is preserved with Snapshots? Virtual machine settings – The virtual machine directory, which includes the disks added or changed after you take the snapshot. Power state – The virtual machine can be powered on, powered off, or suspended. Disk state – State of all the virtual machine's virtual disks. Memory state (Optional) – The contents of the virtual machine's memory. 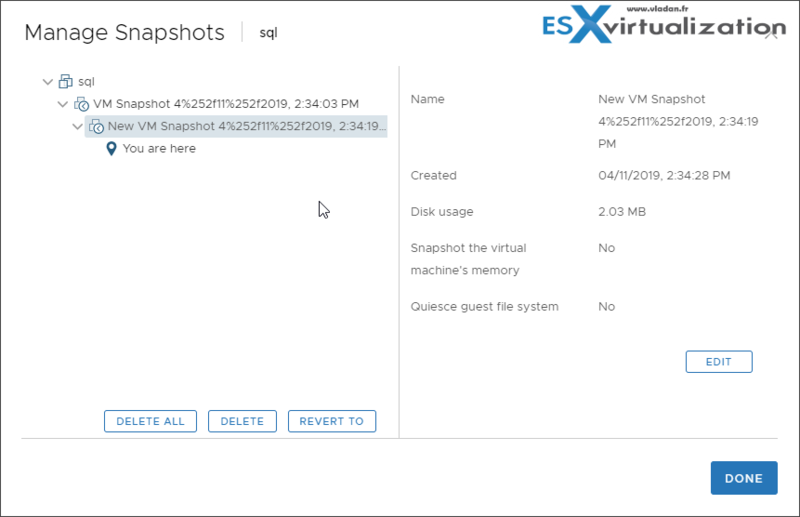 Quiesced snapshots – When you quiesce a virtual machine, VMware Tools quiesces the file system of the virtual machine. A quiesce operation ensures that a snapshot disk represents a consistent state of the guest file systems. Independent Nonpersistent – Changes to disks in nonpersistent mode are discarded when you power off or reset the virtual machine. With nonpersistent mode, you can restart the virtual machine with a virtual disk in the same state every time. You can either delete a single snapshot within the snapshot tree or you can Delete All snapshots. Delete – remove single parent or child snapshot from teh snapshot tree. Delete writes disk changes that happen between the stat of the snapshot and the previous disk state to the parent snapshot. Note: Deleting a single snapshot preserves the current state of the virtual machine and does not affect any other snapshot. Delete All – consolidates and writes the changes that occur between snapshots and the previous delta disk states to the base parent disk and merges them with the base virtual machine disk. The Needs Consolidation column in the vSphere Client shows the virtual machines to consolidate. Snapshot consolidation is useful when snapshot disks fail to compress after a Delete or Delete all operation. This might happen, for example, if you delete a snapshot but its associated disk does not commit back to the base disk. Use the official documentation as well as your home lab for the study. Follow the progress of the VCP6.7-DCV Study Guide page for further updates. Well, this is it for today. We have learned quite a bit about snapshots and snapshots technology. I always have some difficulty with persistant and nonpersiistent disk. I don’t see the real intrest for th non peristant disk. If I understand with a nonpersistant disk when you reboot the vm all the data on disk are erased? Think of Kiosk PCS accessible to a public. They can install all kind of stuff, but then, after a reboot, everything is clean again.